The Canon Pixma TS5053 consists of a printer, copier and scanner combined into one compact unit that will complement the modern office space. This is especially so as it has full cloud and Wi-Fi integration, and the ability to print directly from a range of social media. The machine is controlled from a handy LCD frontal screen but users also have the ability to print and copy from remote smart devices, such as smartphones and tablets. This flexible and space-saving device will prove invaluable for any small office and satisfy sub-industrial scale demand. With a weight of 5.5kg and modest size of 14.6x12.4x4.9 inches, the Canon Pixma-TS5053 is significantly smaller than previous models in the TS5050 range and is easily transportable. The copy speed of the machine is 6 ppm and both mono and colour prints can be made at speeds of 12.6 ipm and 9 ipm respectively, ample for the needs of the small office. An LCD screen on the front of the unit can be adjusted for ambient light and uses intuitive buttons and icons to control the various functions. 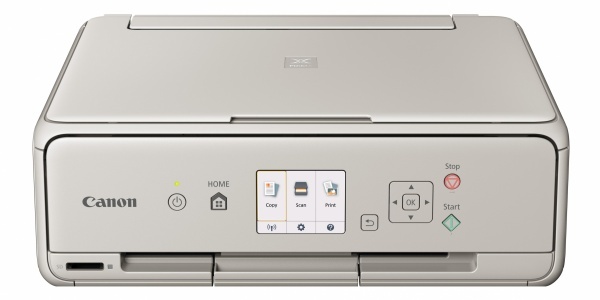 With the ability to use smartphones and other internet-enabled remote devices to control functions, this is a fully networked printer for the modern world. The Canon Pixma 5053 combines all of its operations in one robust and compact unit that can be set up on any handy desktop space. As well as controlling its operations manually via the LCD panel on its front surface, a range of smart devices can be used to control it remotely. There are five separate ink cartridges that can be replaced as they are used up, which is good for the environment as well as the budget. Some potential Canon TS5053 users may not like the old-fashioned oblong design of the TS5053, and the LCD display needs a bit of getting used to if the lighting is not just right.